Hi all, and Happy Sunday!!! Here is a fun little post for a windy day!! Well, at least it’s horrible windy at my house, so I am on the computer for a few moments. For J.J.’s Star trek, the story was going to visit the legendary story of young Kirk cheating the no-win scenario called the Kobayshi Maru. For this project I was given the book and some drawings of the Kobayashi to use as reference to come up with a new starship based loosely on these drawings. I came up with two roughs and then my end day came and I was done working on the movie before anything further happened. Alex Jeager took over from here and best I can tell, he used the version from the book and cinamatized it for the playback sequence!!! I so wish you could have seen what he did a little better and a for a little bit longer on screen!! As always, getting to work on classic Trek lore in the form of an illustration makes for an awesome assignment, weather or not it gets used. So with that, here are the pics from the book and the roughs to help determine the ship’s new movie look! the opportunity arose to submit this old beauty for playback so it had yet another chance to be rejected!!! HAAA! You know me…anything with cargo pods is cool in my book. 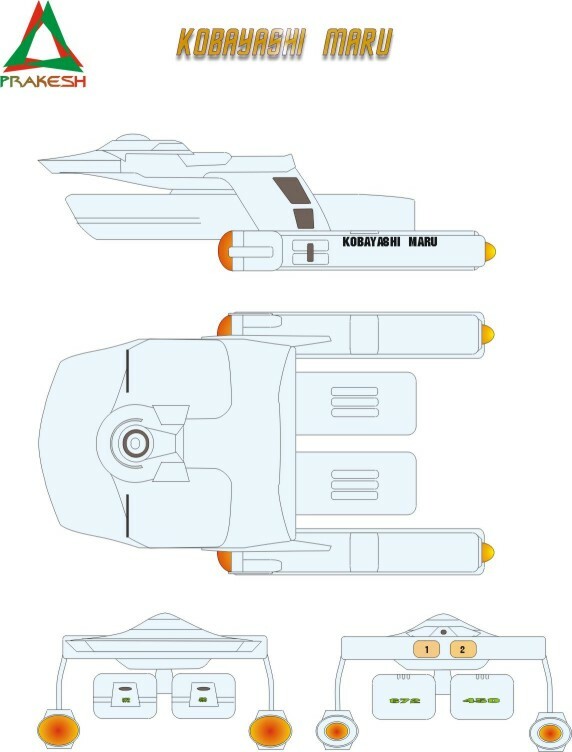 I might have to chop up a PL 1/1000 Enterprise and carve up some more foam and build this one. And why the producers rejected a totally cool Klingon design is beyond me. I like how you updated the Klingon ship while still keeping the classic Matt Jefferies concept in tact. It’s kinda hard to improve on Matt’s stuff. You are the cargo king of Chicago!!!! A little Ferris Beuler for ya HAAAA!!!! Thats funny John. My dad used to fly Dc-3’s and Beech 18’s out of Chicago. I’m gonna have to get a shirt that says “Cargo King of Chicago”…of course it can’t be Abe Froman…he’s the sausage king. No but you are Justin Miller, the cargo king of Chicago!!! I might have to do a drawing of that myself!!! Oh my. I’d be interested to see that. I’m actually in Kansas, but I was born in Illinois (Champaign). My dad flew air cargo for most of his 40 year flying career, and had a brief stint flying charter and for America West. So when Johns posts a picture of a frieghter I get excited. Cargo King of Chicago appeals to me because of my dad fyling Dc-3 full of cargo out of O’Hare and over the States and Canada. I’ve lived in kansas, Texas, Colorado, Indiana and Georgia, even though Illinois will always be home to me. to the Cargo King and Chicago connection. Ah, my wife is from Champaign, and her folks still live there. Was just down there for Thanksgiving, eh. Small world this Internet, eh. I miss Steak-n-Shake and Monocal’s Pizza! My closest Steak and Shake is 3 hours away in Lawrence. We had em all over Atlanta, I miss living there! From what I can tell, it looks like he used your concept 1 but removed the ‘wings’ from the sacuer and placed the nacelles in the same position as concept 2. It must of been pretty daunting working on such an infamous ship that has so much fan material already out there for it! I’m looking forward to your drawings. Looks like I may have to build a couple of these! Yeah it’s hard to say what Alex did but it does look like a mish mash of some things in the quick shot you get to see of it!! Does that drawing from the book actually say “Boeing” as the supplier? Cool! 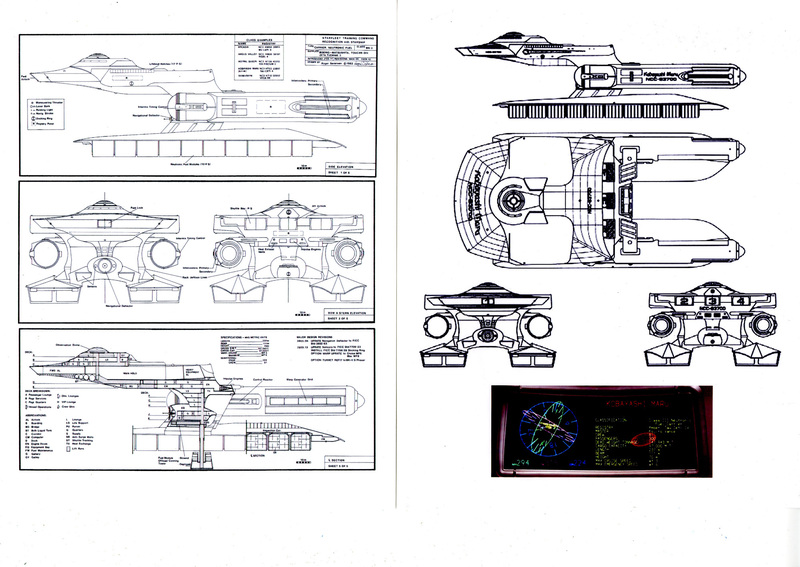 On the image listed as an unknown source, the drawings on the left are fan-made blueprints created by Roger Sorensen in 1983, and the screencap on the bottom right of the image is taken from Star Trek II: The Wrath of Khan. The picture on the front of the novel cover appears to be based on the Tritium-class starship, which appeared in the Star Trek Spaceflight Chronology in 1980 (with illustrations by Rick Sternbach). Hey does Roger Sorenson have a shipyard on Starship modeler??? He’s awesome if this is the same guy!! Great eye for all the details!! Thanks for the notes,, These prints were just given to me when I started drawing and wondered what and where these came from!! Yes, those are indeed the Kobi prints I drew way back in the day; Starstation Aurora was my publisher for them. It’s nice to see that they eventually have made their way into the canon in some form. Every time I looked at the movie’s Kobi, I thought, “That looks awful familiar…” I was going for a “tramp steamer” sort of look, imagining this as a non-starfleet ship that hauls cargo and passengers, mostly “steerage” class. I’ve always intended to do a scratchbuild of her, but of course never got around to it. Thanks for publishing this John, and for those cool images of the Klingon ship. And as dea says, love seein’ these cargo beasties (or “tramp steamers” as ya aptly called ’em). Hey, thanks deg – and that Lindberg UFO… seems a lot of people have a soft spot for that ol’ thang. Let’s see… top, bottom, alien, canopy, engine halves… 8 pieces! 10 if you count the stand. Ah, the joys of simple kits. I pimped out the cockpit, added some sawed-off LEDs and few other doodads and then spent a couple hours on that Metallizer paint job. WOW How cool to have you leave this note!!! What an honor!!! I’m obviously a fan of yours and it’s awfully coo of you to write back!!!!! Awww… shucks… Let’s call it a mutual appreciation society. After all, I describe your blog as “specTrekular” when I send someone your way. Hey Roger!!! Just went to your site and you are the one I was thinking of!!! You did a real nice breakdown of the E-E several years ago with all the Pantone colors and numbers to paint her correctly!!! That was one fine dissection you did there!!! Hi John… I think that E-E Pantone info originally came from Sternbach. All this Kobi stuff got me motivated to dig out the original pen & ink artwork and write up a little “spotlight” memoir about it on my site. “One of these days… Kobayashi Maru”! I really like this concept. 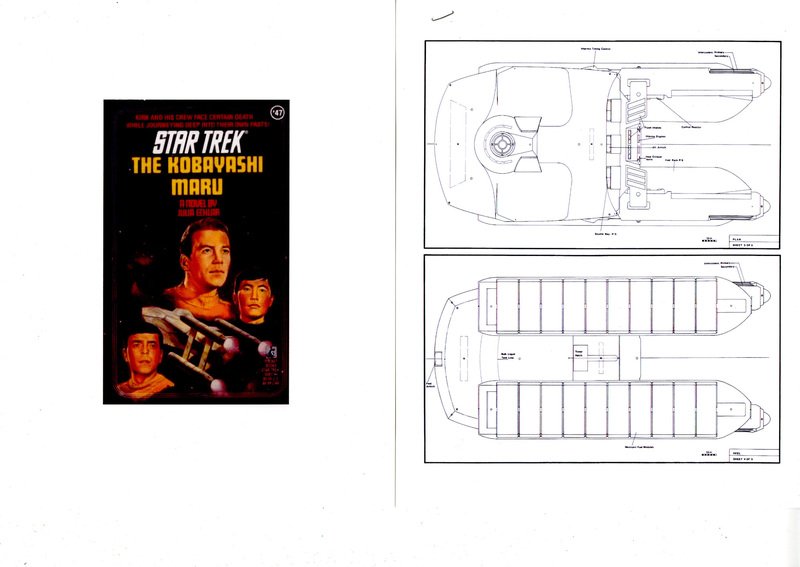 I suspected that it can’t be a coincidence that the Abramsverse Kobayashi Maru looks similar as the novel version. And I can’t wait to see the reconstructed orthographic views of the finalized ship. This Klingon concept remains my favourite Klingon design ever, second only to the original it elaborates upon. Thanks for posting in high res, so far I’ve only ever seen tiny repros, like the one in the new Art Of book. HA, more awesome stuff, never to be rejected by me! I think I may have to build your version of KM, to go along with your D4 to make my own take on the Kobayashi Maru incident. And thanks for the HUGE version of the D4 artwork. I see some small things I need to add and/or change a touch, eh. Thanks Deg and your ship is looking to cool for words,,, Are you going to Degorate it with some of your awesome little extras like you did with the Jefferies Enterprise??? 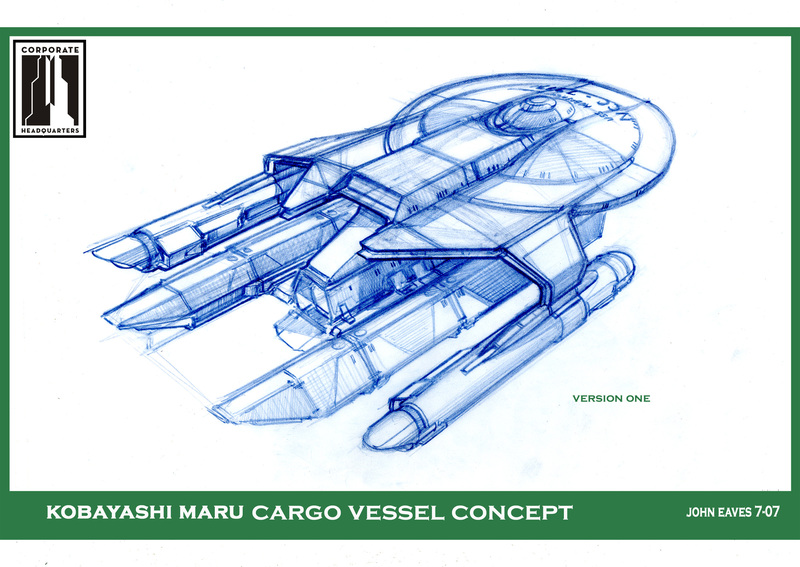 Great to see those Kobayashi Maru designs too, either of those concepts would have been perfect in my opinion, as was the version veeeerrry briefly seen in the movie. So glad Alex Jeager was on board, I loved his work on FC. Thanks and I love Alex’s work!!! He’s awesome and I so hope he gets a go at an Enterprise one day!!! Never realized how different the Maru really was. And since we were talking about the simulator, did they use the traditional D7 design or did they make an alternate universe version of it? It’s got quite a bit of alterations done to it actually!! There was a couple of pictures of it in the new book!! And I too love your Klingon ship. I dunno why it keeps getting rejected, it’s the next best thing to the classic D7/K’t’inga, IMO. Thanks for the note and my pleasure!!!! This is the first time I’ve seen the cover for this book. The design is very interesting! I always wondered what the ship looked like! Too bad your last day ended before you could see this design to the end! It was looking pretty good!! I had a full palette up to the last day and crammed these in as the big farewell!!! I may be mistaken, but the pics from the “unknown source” look a lot like FASA designs. Great ships. Hated the scene though. I found myself wishing that the arrogant, disrespectful kid would choke on his apple. Loved the Kobayashi Maru scenes, and great to get another look at the ship itself, as you say John it appears far too briefly. Really heartwarming to hear the earlier incarnations of the design were incorporated into the design process. Thanks very much for posting these, it’s really great to see more material from the movie! 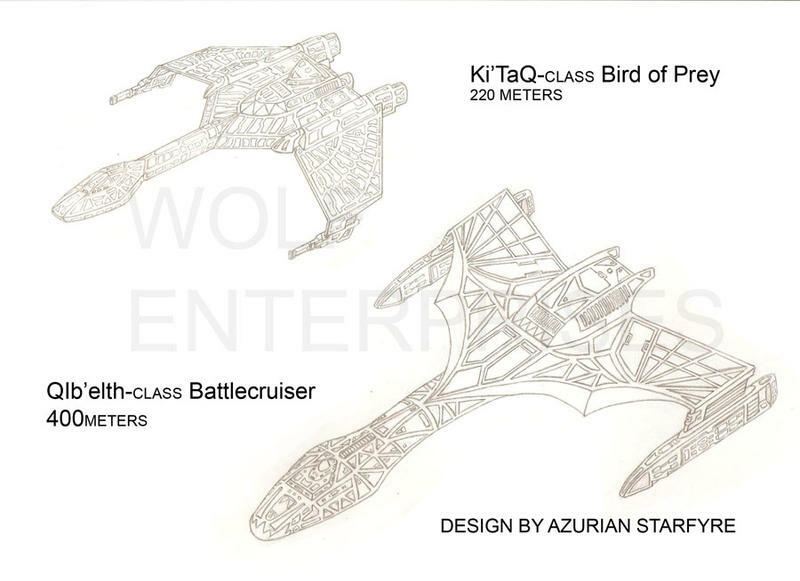 Are we likely to see more of your updated Klingon battlecruiser for the movie too at some point? (Are there any orthos out there maybe? [drools in anticipation] 🙂 ). Sorry! It’s likely some sort of fan art. As for the novel, that’s actually a Rich Sternbach design, the “Tritium class” for the old 1980 Star Trek Spaceflight Chronology. The Tritium was supposed to be a fiasco of a new “queen of the fleet” design from about 70 years prior to TOS, and provided a bit of explanation why tri-nacelled designs were so rare. FYI – Above in this thread, Roger Sorensen is identified as the maker of the “unknown” work. Thanks! That’s one of mine. Nice to know that people remember it. RicK Sternbach, that is. Me and my hasty posting, didn’t proofread adequately. Very cool to see fandom designs make something of an appearence in ‘real’ Star Trek. Three sketches there: Harry’s and two later revamps by “the Reverend”. Very nice post and final design for the ship. It does have a bit of a FASA to me. Strangely the Kobayashi Maru in the “Star Trek Enterprise” novel of the same is described as that of a Klingon battle cruiser. I had wished that the ship was shown actually “visible” when I saw it at the theater…man, it just showed up for a couple seconds! Now I’ve got the disk and could get a bit better look. I like your concept one best, John. I also liked the way Alex did it in the movie. I could stand to see more of these cargo beasties! I thought the cocky, apple eating scene was a fun shout out to a very familiar scene and as close to actually having Shatner in the movie as they were going to go. 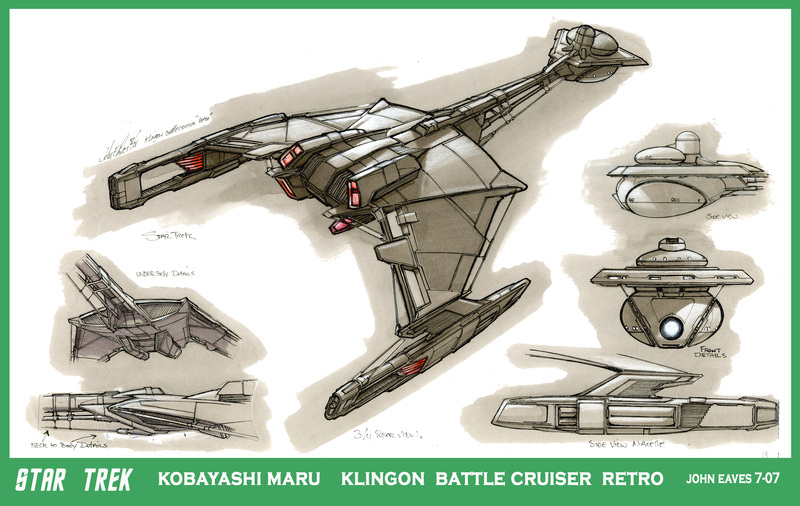 This design was mentioned in Micheal Martin and Andy Mangels’ ST- Ent novel Kobayashi Maru and the acknowledgements page refer to the drawings above by David Nielson. I highly recommend that novel for those who enjoy Enterprise. I know that many do not consider the Novels as Canon, but there it is, nonetheless, FYI. I always liked the Sorenson version the best, but the backstory for the Nielson design is more interesting to me. I like to think that perhaps there are two ship-types out there . . . The drawings on the left above the “Star Trek II: The Wrath of Khan” screen shot are by Eric “Jackill” Kristiansen. The “Kobayashi Maru Class Nuetronic Fuel Carrier” from “Jackill’s Star Fleet Reference Manual: Ships of the Fleet Volume III” (January 1995). Hope that makes everything right, not that I’ve a dog in the fight. As long as there was some attribution / acknowledgment, I’ve got the peace of a Hindu cow. Ships of the Star Fleet ranks as probably the most professionally done fan tech publications I’ve ever seen. Others tried to copy it, but they really captured the feel of the US Naval Institute’s Ships and Aircraft of the US Fleet series. The Jackill’s series was awesome too. Another book, Starfleet Dynamics was particularly interesting. There was also a magazine-book called Starship Design that was along the lines of Naval engineering magazines. Yes, I’m familiar with all of them. But I still think that Ships of the Star Fleet was the best. Best ship designs (some of the others you cite leaned too much toward kitbashing) Starship Design also had some lousy prose. SotSF felt the most realistic, like it had dropped through a timewarp. But yeah, I miss the days when there were fans producing obscure Trek tech books. I need to correct what I posted earlier. Starship Design was an excellent publication, which I think was done by the same people who did Ships of the Star Fleet. I was thinking of a publication that showed up a few years later called Starfleet Prototype, which used a similar format (dimensions) as SotSF, but was not nearly as good. It read like it was written by lawyers. Hello John Eaves, this is quite interesting as I had been wondering about this design for some time. I also noticed that the Klingon design shown in the film is slightly different than previously shown versions; there is a ‘lip’ around the front tubes, an arrow shaped cowl on the bottom, and ridges on the neck. I wondered if the klingon designs had also been affected in the same way the Enterprise was or was it a different design altogether. If you could spare a moment, send me an email as I would like to ask you a few questions on this design and others. As for the scene, I didn’t like Kirk’s attitude either, it was as if he was flaunting the fact he was cheating. I think it should have played that he “exploited some little-known flaw in Klingon tech” and made an unexpected maneuver that let him win the battle. Rather than taking it so lightly and munching an apple while he waited for the reprogramming to kick in. All too easy as it was. Made the whole sequence silly rather than one that truly would make Spock and all wonder how he actually did win. Although I agree with your sentiment about the scene, I have to point out something that I did not realize when I saw the film: Kirk eating the apple was actually a shout out to the scene in STII where Kirk talks about beating the Kobayashi Maru test–while eating an apple! There are a lot of call backs, inside jokes, and references to earlier Trek in that movie. Another one that I did not pick up on until much later was the fact that the Vulcan landscape, with the diagonal rock outcrops, is modeled on Vazquez Rocks outside LA, where Kirk first battled the Gorn. And to clarify my last post, I know that the real reason he could win was due to the reprogramming, but it should have at least looked a little believable, like only some small element in the program was changed rather than “suddenly all their shields are down.” Having him “apparently” pull some ploy that enabled him to lower their shields and then fire, would have made more sense than suddenly having everything be more simple than a video game. I agree, that was one of the few things I took issue with in the new movie. I could live with all the design changes and the whole alternate timeline gimmick, but I thought that scene was a bit of a let down considering what it could’ve been. Why go to all the trouble of changing the program so you can win, and then make it blindingly obvious by having the lights flicker and the enemy ships blow up with a single shot? I know Kirk’s cocky and all, but I would’ve imagined something more subtle that would’ve left everyone scratching their heads and thinking he really had beaten Spock’s test. I love both of these desgins. very cool! Did they ever finalize the registry number on the CGI model as used onscreen? If so, it wasn’t legible in any of my viewings of the movie thus far. I only spent about an hour with it but the mesh is starting to take shape. Here is the very first image, hope you like it ! Do you have orthos of this? I’m attempting to build one of these…maybe have it done and on the table at Wonderfest. Hey the model is extremely basic for now but once I’m finished I will post orthos on my photobucket account. Just delete the image address and you will be on my account page. I don’t upload that many pictures so it will be easy to find. Cool. Not looking for details just a basic shape I can springboard from. I figure I will modify a PL 1/1000 enterprise and either carve up the cargo pods out of foam or. That is if John doesn’t mind me interpreting his concept and doing a model of it. Thanks Pearse ! I see my SFM activity got me popular around the internet ! Anyway I am studying for an exam from soil characteristics or something like that, I don’t know how to translate it (yes I am studying about soil/land engineering and stuff but doing 3D in free time, they go well together …) so I didn’t have much time to add details to the mesh. You can visit my account to see some more views. Just downlaoded your meshes. I think I;ve got enough to get started and start converting my Connie drawings to a KM. I’ll probably keep the TOS style engines and just mod them. could you post some pics of the new Klingon Warbird which was acting in the Kobayashi Maru scene? 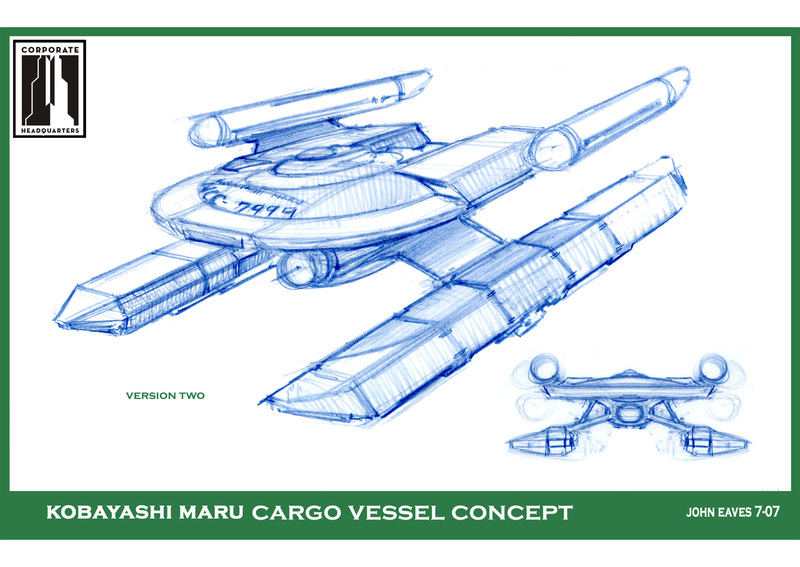 The Kobayashi Maru design (concept 2) looks as if it could be the basis for a space carrier (the two things on the bottom could be landing bays like the ones on the Galactica.) Great work.